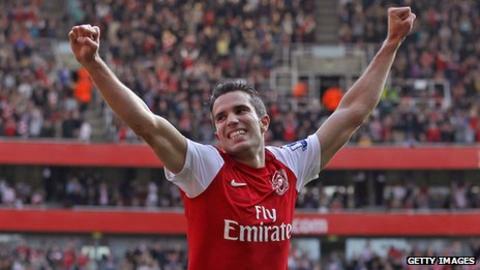 Arsenal captain Robin van Persie has been named as the Barclays Premier League player of the month for October. Van Persie has scored seven goals in his last three league games, including a hat-trick against Chelsea. Manchester City boss Roberto Mancini is manager of the month after leading his side to four straight wins. City lead the Premier League by five points after nine wins from 10 games, including their memorable 6-1 victory against Manchester United. Mancini's men averaged four goals a game during the month, also beating Blackburn, Aston Villa and Wolves. Van Persie's goals have helped the Gunners climb up to seventh in the Premier League table after a shaky start to the campaign.